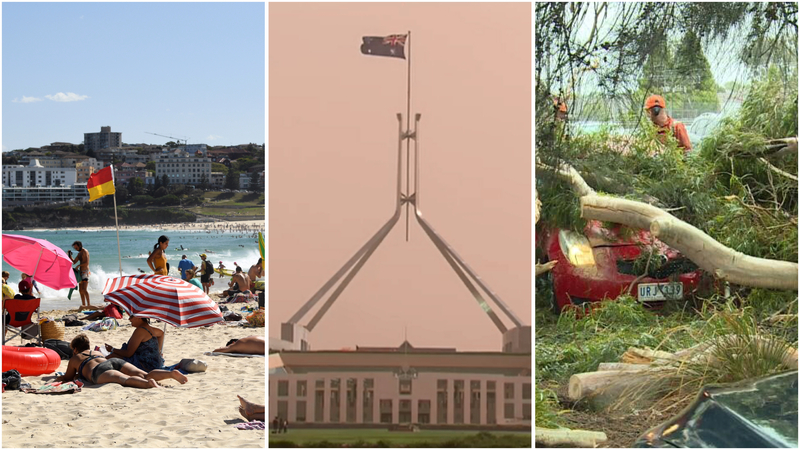 Australia has been hit with extreme weather as scorching heat, strong cold fronts and dust storms sweep the nation. Temperatures plummeted in southeast Australia today, making the warmest January on record for Victoria and Tasmania seem like a distant memory. This is due to a strong cold front that has brought almost winter-like conditions to the two states. After reaching a top of 21.5 degrees at 10.30am, Melbourne’s temperature dropped to just 14 degrees 30 minutes later. By midday it dropped to 12.7 degrees before rising slightly in the late afternoon. A severe weather warning was issued for damaging winds in parts of Central and Gippsland districts. This afternoon the SES has been called to more than 50 locations for tree damage to roads and buildings. In Tasmania, Hobart sat at 15 degrees around midday but the winds made it feel closer to 10 degrees. Mount Read cooled to just 0.5 degrees just before 2pm with snow sighted at 800 metres above sea level. The surge of cold air in this part of the country is pushing a mass of warm air into New South Wales with most parts of Sydney sitting above 35 degrees, 20 degrees warmer than Melbourne at the same time. The NSW Fire service has declared a total fire ban across the state as hot, dry and windy conditions continue. A dust storm developing in western parts of the state will see airborne dirt from drought-ravaged areas reach the coast this evening with parts of the capital already affected. More than 6,000 people have lost power in Canberra and a health warning has been issued because of the dust pollution that has left the city covered. Powerlines were down in a number of locations. The ACT Government warned the conditions meant reduced air quality and people with respiratory problems should avoid venturing outside. The dust will remain through the evening. The Northern Territory and Western Australia have seen temperatures in the high 20s and early 30s with storms forecast for the north on Thursday and the weekend. As Queensland continues to face catastrophic floods in the far north, a bacterial infection outbreak has been confirmed with one death. The Queensland Government is urging those affected by the floods to avoid getting contaminated water into cuts or scratches.